This version of Captain America is based off the newer male body type we have seen used already for several characters in the last couple of years. 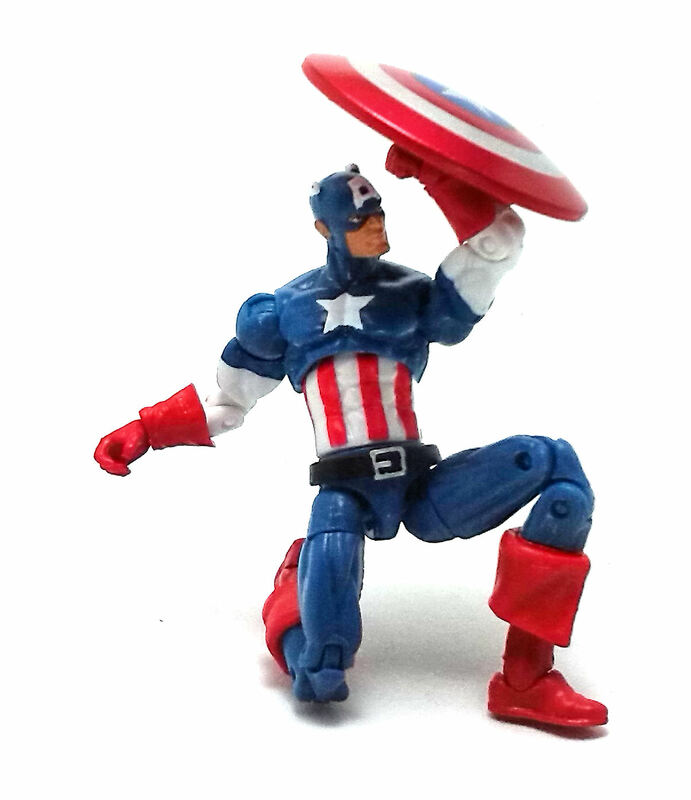 The base body is very well proportioned and articulated, and Cap’s outfit was further personalized by adding extra rubber elements to simulate the cuffs in gloves and boots, as well as a belt piece. 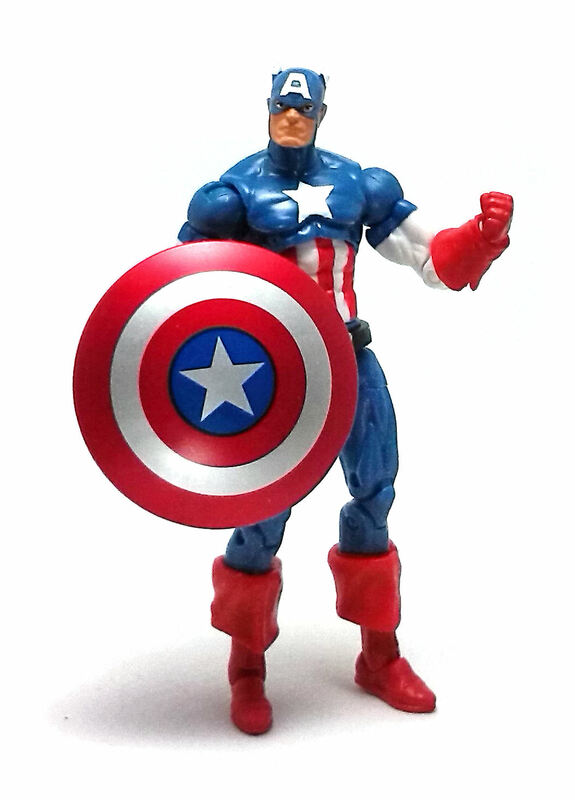 The head is also unique, even if it is very similar to the portraits already used for the previous Captain America movie line. It features a strong jaw line and sculpted wings at the sides, as well as an engraved “A” on his forehead. 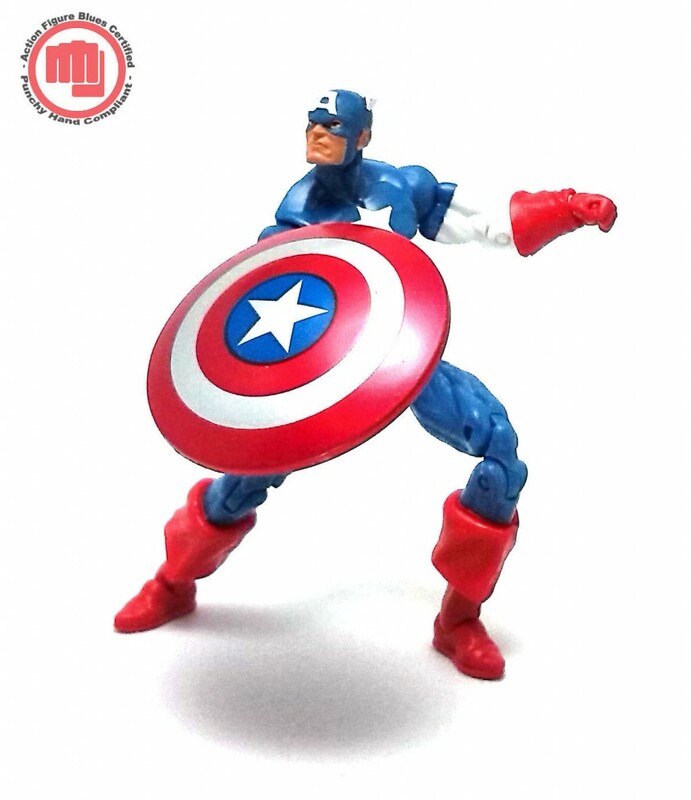 About the only thing missing in this figure for an authentic Classic Captain America look is the scaly texture on his upper torso, but only purists tend to take issue with that. I really like this articulation scheme, as it offers a much greater range than the original, first generation body molds that debuted with this line. The paintjob on Captain America is simple but effective. Most of the body was cast in a medium blue color, with selected pieces molded in differently colored materials, like the red boots and gloves or the white mid-riff. There are a few pieces which have small sections painted in different, solid colors to better portray the costume, like the white sleeves and the red stripes on his shirt, as well as the exposed skin area on his face. For the most part these paint applications look neat and clean, although on finer details like the “A” on his forehead or the wings on his head the edges get a little blurry. 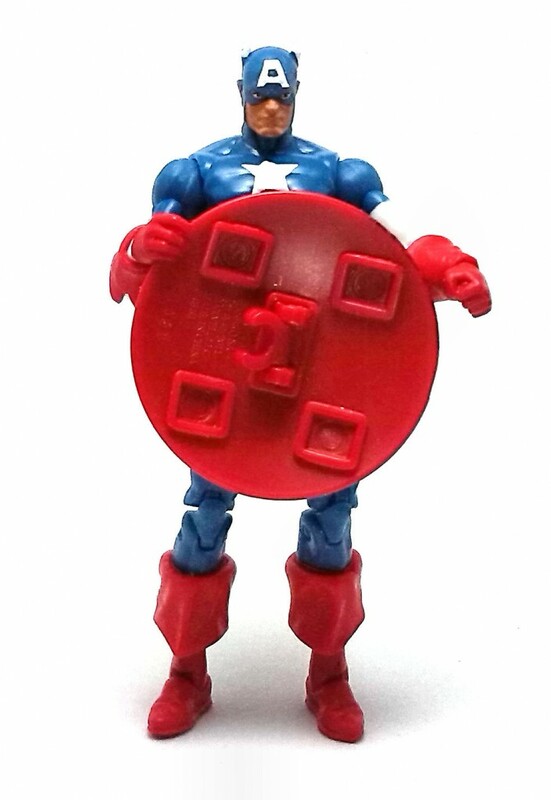 Series 5 of the Marvel Universe line is very sparse in terms of extras packaged in with the figures, so Captain America only gets his trusty shield. This piece comes molded in red plastic and has the front decorated with glossy, metallic paints. The shield has some indentations molded on the inside to secure straps or some other fastening device, but instead it only has a fairly flexible C-clip glued to the center on inside. 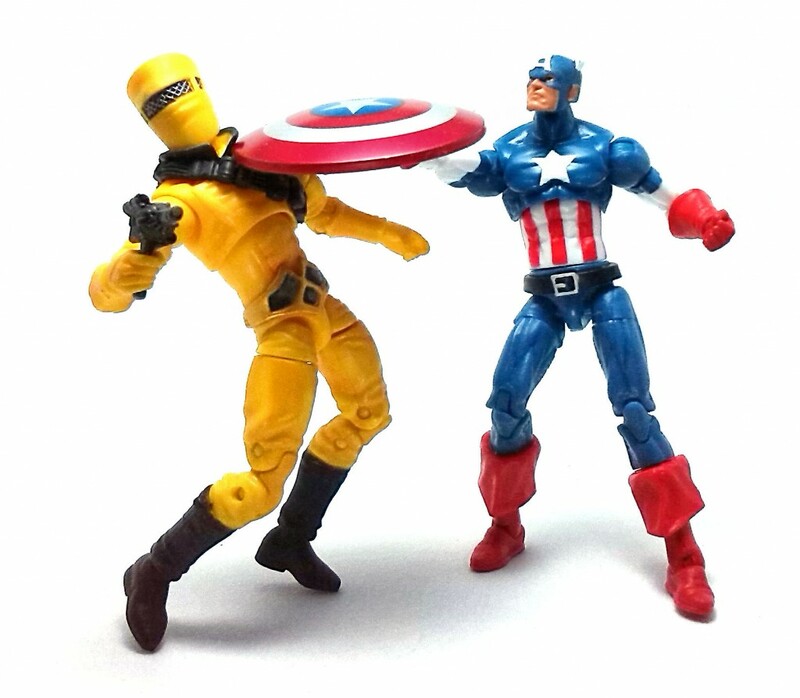 The clip can grab onto Cap’s forearms with a little effort and stays in place reasonably well. 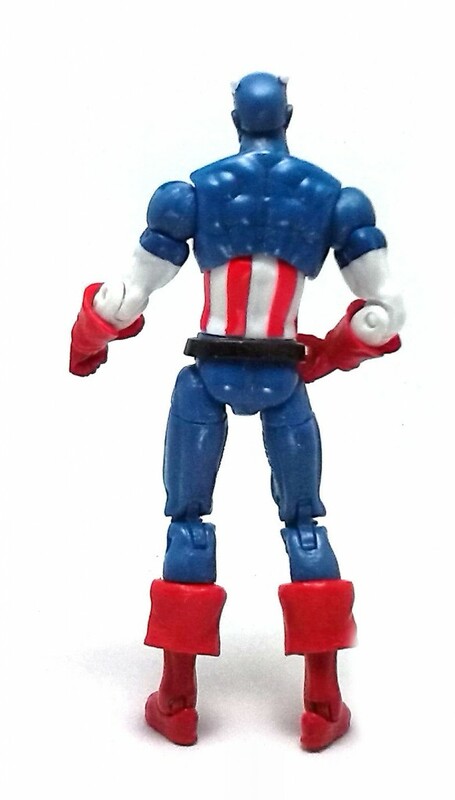 In a market somewhat saturated with Captain America incarnations, I have to say that this classic take on the Star Spangled Avenger is absolutely worth picking up.